After last year's beautiful competition everyone was eager to have such a nice experience again. So we were glad when at last the sun came out, so that the Championships could take place on well prepared courses. And participants and audience did enjoy the great atmosphere of the second Tyrolian Championships at the Luechhof in Schwoich just like they did the year before. 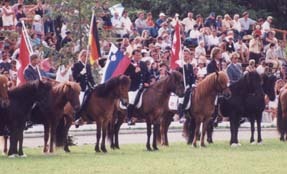 Icelandic Horses and their Riders from Bavaria, South Tyrol and all parts of Austria came to compete. This variety of people made sure that they had lots of fun the whole three days and not only on the courses. The fun was doubled by the fact, that the family Schausberger served Tyrolian specialities and the famous Bavarian beer. The Finals of the Championships were especially thrilling and the points received were remarkable: 7,4 for Harriet Loidl-Starnberg in Tölt 1.2 and 7,7 for Reinhard Loidl in Tölt 1.3.. Congratulations! 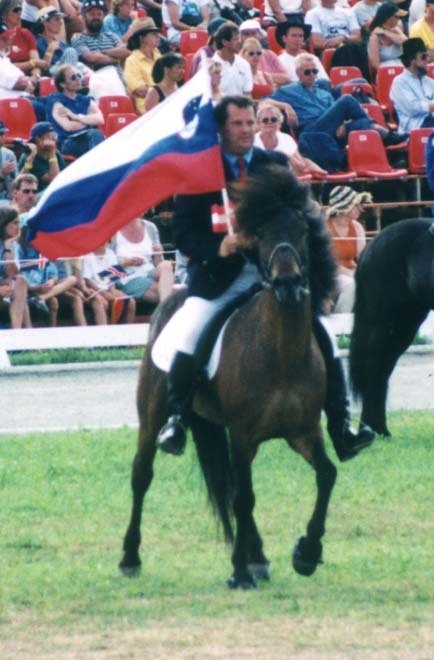 But the title Tyrolian Champion in the adult class was achieved by the host himself Peter Schausberger with Örvar fra Ulfstödum. The 15 year old gelding had already been showing remarkable talent in this season - not to forget at the WC in Kreuth. There he was finally ranked third place in the overall ranking. So his owner Margit Schausberger again could be very proud of the team! A very impressing start of her possible career showed Christine Karrer. With her horse Jasper she won the Dressage as well as the Fivegait competition in her class. 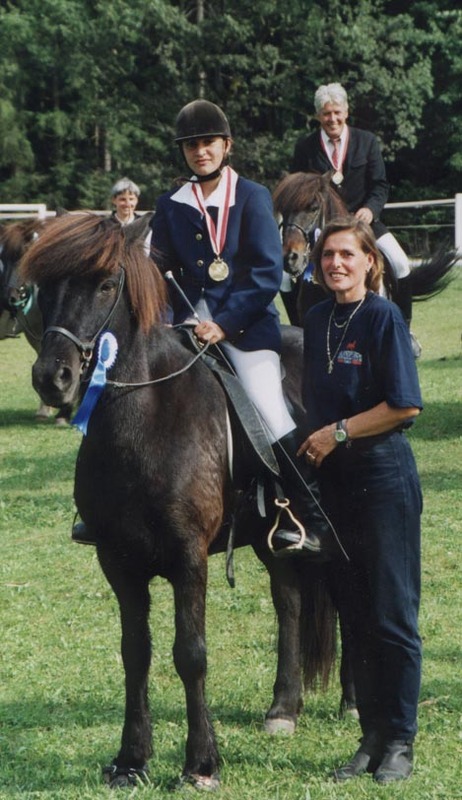 Petra Danzer with Bretta was placed first in Tölt and Fourgait. The young competitors performed especially good this year. Many of them showed there potential in a pretty convincing way. In the youth class Felicitas Wörndl won the Fivegait and the Fourgait finals. Star of the young competitors was without doubt Tanja Schausberger, the 13 year old daughter of Margit and Peter Schausberger. She achieved the title Tyrolian Champion of the youth class. Besides that she also won the Dressage, the Tölt and the Fourgait. 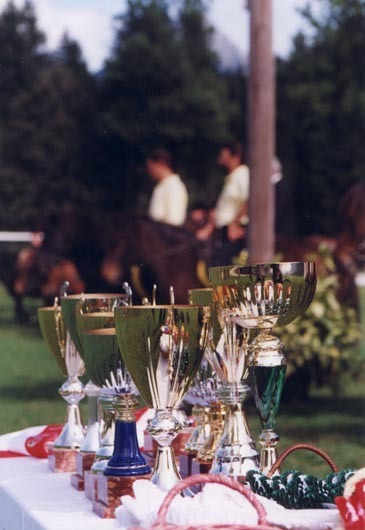 To see the winners in the different competitions and classes please visit the site provided. To enjoy more pictures of the championships please go to the new part of our Photo Gallery. It was very exciting for us to have a horse participating in the event of the year. 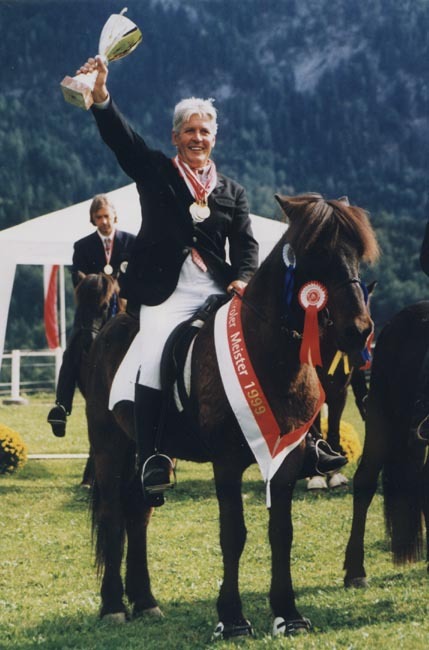 The 15 year old gelding Örvar fra Ulfstödum had already won several competitions all over Austria before starting at the World Championships in Germany. 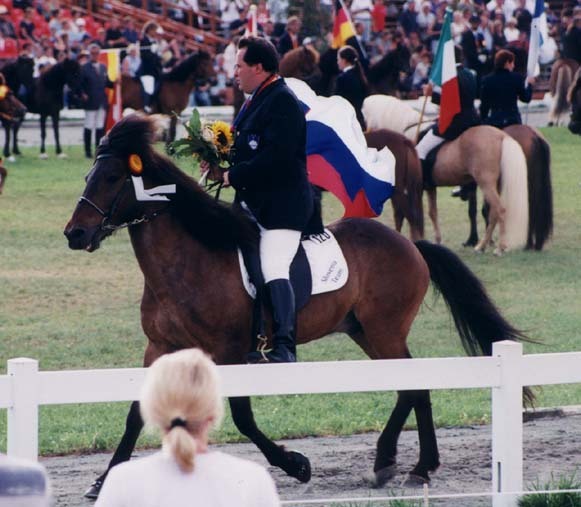 Alexander Sgustav who had trained him for this event started in Kreuth for Slovenia. Örvar particularly showed his versatility competing in many different disciplines. He became marvellously sixth in the pace race and did so well in the other disciplines, that he was finally ranked on the third place in the overall ranking - the bronze medal. Being the third best horse (and rider) in the world Örvar and Alexander showed themselves proudly at the parade. except when mentioned otherwise. No part may be reproduced in whole or in part unless prior written permission has been given.